Backpacking in Colorado is the best way to truly experience our large wilderness areas, national forests, and public backcountry land. Traveling on foot is quiet, low impact, and slow enough to really appreciate your surroundings. It is important that we protect and respect these special places and follow the Leave No Trace guidelines. 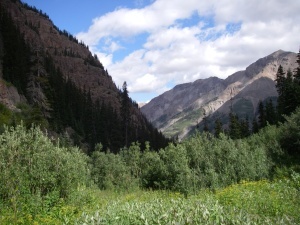 The trails in Colorado are extensive and the backpacking opportunities seem endless. We cannot list them all here but we do have a few favorites to share. Before we get started take a look at our backpacking checklist. You may find some valuable insights. The area around the Cimarron River is backpacking paradise. This trail is in the Uncomphagre Wilderness and National Forest. You can backpack the trail system here for months and manage a few fourteeners while you are at it. Start at the East fork of the Cimarron River and make the 23 mile loop finishing on the Middle Fork of the Cimarron River. This can be done in two days but if you want a longer hike several trails branch off. This area is full of wildlife and has some incredible geology. 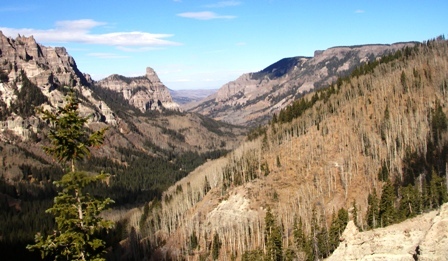 Located near Creede in the Weminuche Wilderness this is a 20 mile hike with extra possibilities. The Continental Divide trail can be accessed as well as several other trails. After walking through the Rincon La Vaca go ahead and branch off the trail to climb the pyramid. It is a bit of a scramble but once you reach the top on a clear day the views will take your breath away. Backpacking gear information for successful backpacking trips, covering tips, stoves, tents, sleeping bags, backpacks, food, cooking, clothing and much more. Want to share your favorite backpacking stories, trails and tips? Share your stories, trails and tips!